It’s time for the third installment on the Batman Forever rebuild. I’ve been a little slower than I’d like getting this update posted, but it’s been a busy time of year (and getting busier as we race towards Christmas). Having worked through the lower playfield areas in previous updates, I’m now going to focus on the middle playfield sections. This area is home to an upper flipper, some stand up targets and also a 4 bank of drop targets. 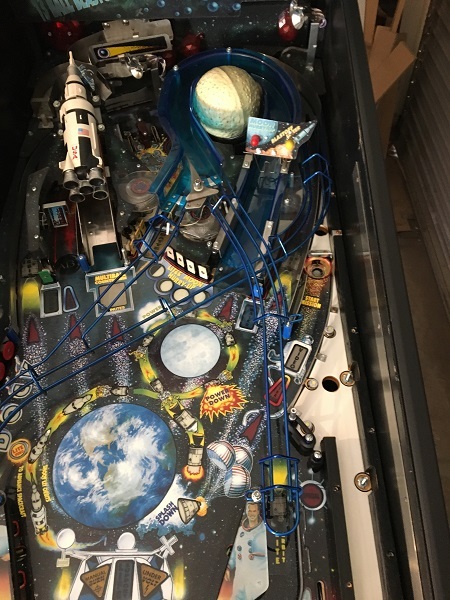 There is an orbit shot which I want to remove the parts from and clean too as the rails are attached under some of the middle playfield plastics – so it’s easier to deal with that now than have to remove plastics again to remove the orbit rails at a later time. To start with though, I’ll need to remove various rails and ramps to get access to the playfield parts below. I’ll start with the right side. Progress on Harley has been traveling along really smoothly over the last couple of weeks to the point where I’m closing in on the final playfield assemblies to service. The first area to look at in this update is the pop bumpers, which will also include the scoop which sits just in front of them. There should be a plastic Harley sign that sits vertically on top of the scoop that has been broken off some time in the past. The pop bumpers are filthy and overdue for a full rebuild. I had planned to begin this update with a really bad pun, but I’ll save you the anguish and get straight in to the good content! 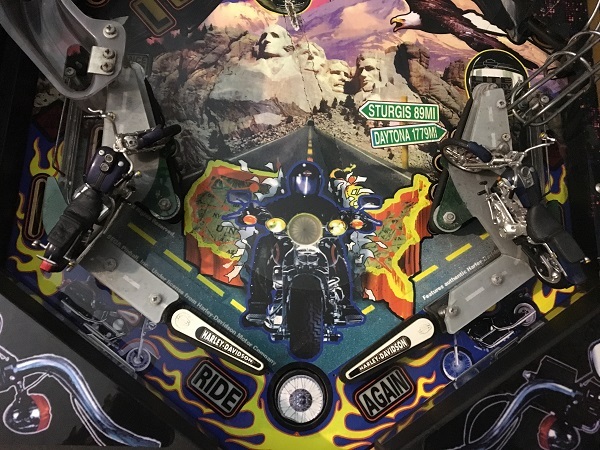 This update will be focusing on the assemblies in the lower section of playfield, along with cleaning up the drop target areas. 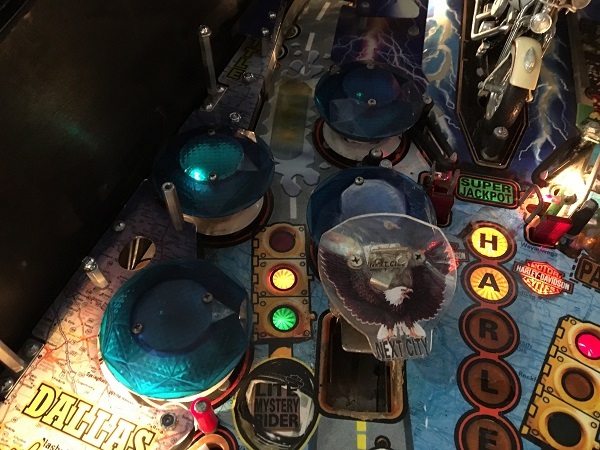 I’ll also the look at the upper orbit shot as some screws that attach the metal rail to the playfield live under plastics in the mid section – so easier to do that all now in one go. The game has been played a lot over the years, with broken plastics across most areas of the playfield. The sling shot and return lane plastics are cracked or missing a few pieces. The bikes are still in one piece though, which is good news. Having worked through the lower and middle sections of the Apollo 13 playfield in previous updates, it’s time to turn my attention to the upper section. There aren’t that many assemblies to get through, but quite a lot of parts to remove, clean and then install again. So it’s still a time consuming process. My first area of interest in this update will be the pop bumpers. But before I can get there, I have a few things to remove. In previous updates I had already removed a couple of the blue rails, but now it’s time to remove the rest so I can get to the pop bumpers. 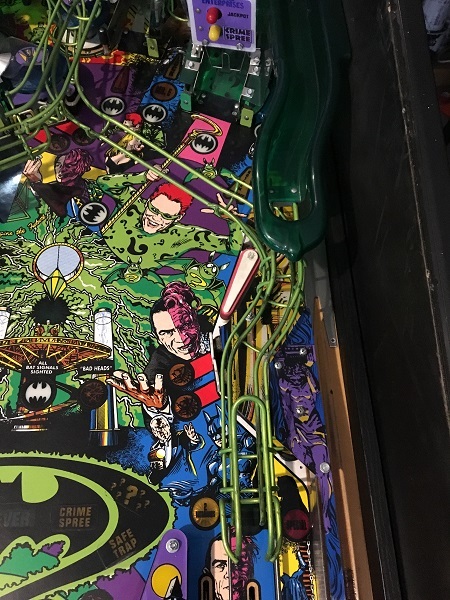 Colour displays on pinball machines are awesome! That’s probably stating the obvious, but once you’re playing in colour, it’s hard to go back to boring old orange and be satisfied. The owner of this Apollo had been thinking of adding a colour display from ColorDMD and decided to go ahead with it. There are two versions of colour display you can get – LCD and LED. 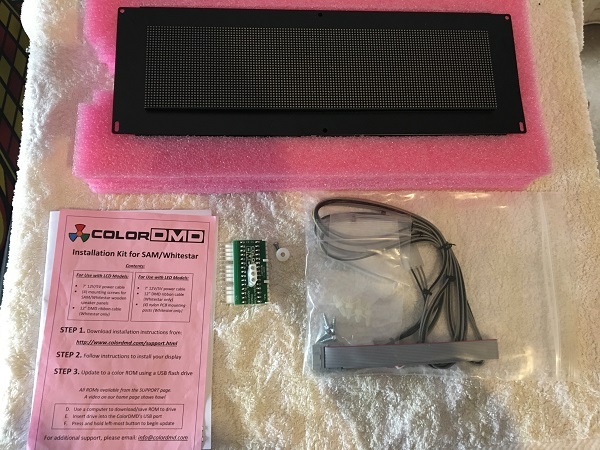 This one’s the LED version and comes with everything you need to get it installed – it’s designed to be simple to install. Let’s get that new Colour display installed and see how it looks!